"What does this mean—What—does this mean...."
"Why, even the lamps aren't lighted. That's going too far with the revolution." Death was a blessing, so great, so deep that we can fathom it only at those moments, like this one now, when we are reprieved from it. It was the return home from long, unspeakably painful wanderings, the correction of a great error, the loosening of tormenting chains, the removal of barriers—it set a horrible accident to rights again. There she stood, victorious in the good fight that she had waged all her life against the onslaughts of reason. There she stood, hunch-backed and tiny, trembling with certainty—an inspired, scolding little prophet. If we have to pick one aspect that might make Buddenbrooks the first important novel of the twentieth century, it could be its moral ambiguity. 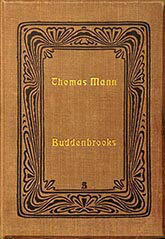 The story of the Buddenbrook family is told over four generations ending in the latter 1800s, but Thomas Mann's perspective is modern—sympathetic to all, but ironic, detached, passing no judgment on the choices made by the members of the family, letting time heal or hurt at its own pace. Plenty of drama, but no villains. And no inspiring heroes either. It is well-known that Mann based the tale on his own well-to-do merchant family. The character thought to be modelled on himself is young Hanno, the artistic son whose death after a short life of not fitting into his family's plans for him to be its saviour from decline finally signals the end of the dynasty. Each Buddenbrook generation, since the original mercantile founder of the family's wealth, faces increasingly difficult dilemmas of having to choose between personal inclinations on one hand—love, art, pleasure—and family obligations on the other. And increasingly the choice of the latter takes its toll. Yet Mann is careful not to make the novel an all-out plea for self-fulfilment. If anything the conflict between the personal and the social is presented as an unfortunate characteristic of human beings, the natural order of things. Even when characters from outside enter the family and wreak small havoc on its status and financial stability, they are depicted not as masterly evil-doers but as weaklings at worst—dangers to be paid off or steered around. The good ship Buddenbrook sails on toward its inevitable end, determined by the contradictions within itself. But this is for the most part a bloodless progression. The rise and fall of a family history is a working out of competing ideas, under the eyes of an impartial but imperial God. Despite the author's later association with leftist views, in philosophical-political terms Buddenbrooks is more Hegelian than Marxist. In the period covered, Europe was convulsed by several upheavals and real blood was being shed, but the story of the Buddenbrook family floats above all that, intersecting with it only at one juncture to bring out a particular public aptitude of a Buddenbrook patriarch. In this sense Mann's ambivalence toward good and evil within his family mirrors his disregard for the greater causes in which they could not help but be situated in real life. Only in later books do Mann's characters engage the social drama of the age more directly. One could argue of course that Buddenbrooks is not about politics and should not be judged by that criterion, that not every novel has to be about the social revolutions of its day. I'm not arguing that it should be. Far from it. Buddenbrooks focuses on the life within the family and in so doing it is an admirably unsentimental, realistic depiction of that life and the quandaries that beset those involved in it. I'm just pointing out that this is notthe whole story.